What's a pet pal's favorite day? Any day without a bath, of course! Keep your furry friend smelling fresh and get rid of allergy-causing dander with Bath Pet Cleaning Wipes. These gentle, all-natural wipes naturally moisturize paws and skin and keep the coat shiny and healthy. 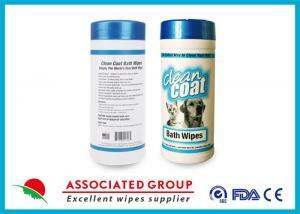 Suitable for cats or dogs. Hawaiian Awapuhi extract conditions coat and imparts a show quality shine. Aloe vera and vitamin E moisturize coat and skin. Do not flush wipes. Store in a cool, dry place. Associated Group is a family-owned company which was established in Hong Kong in 1984.
punch,printed spunlace,spray bonded fabric,air-through fabric, filter products etc. Hong Kong Enterprise established in Shenzhen,Guangdong Province,China.